Use a shelf insert to make a perch for your birds! Get a shelf insert or shelf stand. Turn the stand upside-down. 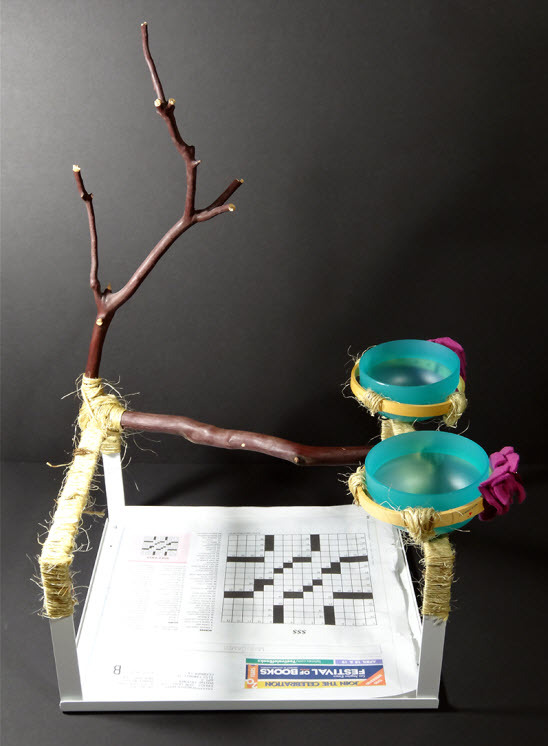 Get a sturdy tree branch that is safe for your birds, and tie it onto the legs of the stand with sisal rope. Wrap the sisal rope around the legs of the stand on both sides. Get a wood hoop that fits well around your bird’s bowls and tie the hoop securely to the stand, ensuring that it can’t tip in any direction. If there are any screws protruding from the stand, cover them with pieces of cork.